PAINT COLOURS: We are suggesting 2 possible colour palettes from Farrow and Ball’s colour range. The lighter of the blues is Blue Ground. It would sit well with Lime White and Old White as shown. The darker turquoise blue shown underneath is Vardo and would sit well with Pale Powder and Cornforth White as shown. The visual of the ceiling in a bar in Puglia shows how your could play with the blue and white on the ceiling. 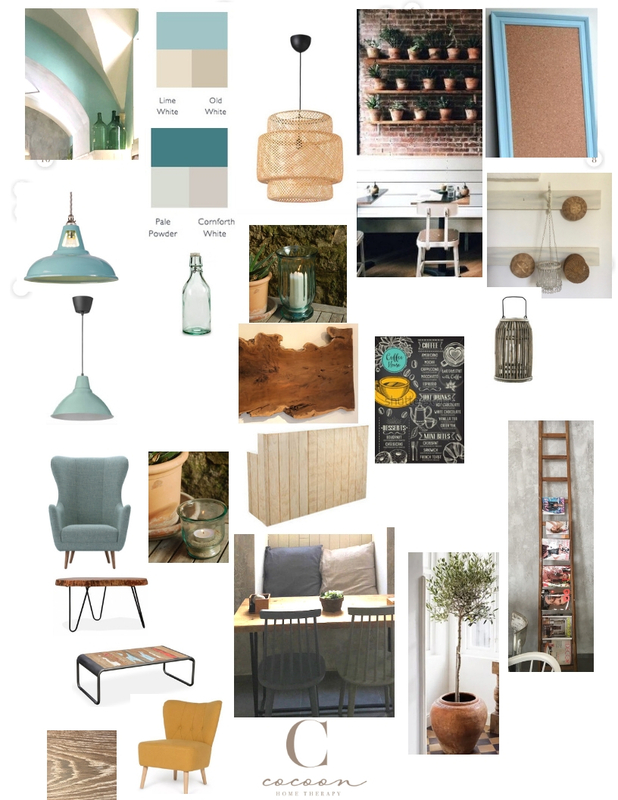 The complimenting colours could be used for the wooden chairs, the wooden storage at the back of the bar, frame on a cork pin board etc. LIGHTING: One idea could be the have large bamboo shades in the 2 centre lights and blue metal shades coming down each of the side areas between the spots. We are showing where to shop for these in the Shopping List next to the board below. BAR: As mentioned, we suggest using the lovely piece of wood you have for the top of the bar and then a wood panelling to clad the front of the bar, either in natural wood as shown or painted (in the Old white or Cornforth White depending on the colour palette choice). Displaying cakes on rustic boards and using coloured glass lanterns as shown on the bar would work well. WALLS: As mentioned, we suggest painting the arched ‘windows’ in blackboard paint for messages and menus. Follow one of the colours from the 2 colour palettes for the rest of the wall space. Other possible ideas for dressing the walls could be shelves with terracotta pots with herbs, large cork message board (for postcards, photos, community notices), hanging lanterns, baskets. TABLES AND CHAIRS: You mentioned that you would like one side of the cafe to have tables and chairs for eating and the other half to have lounge chairs for coffee. I know that you mentioned that you have items you might want to use but if you would like our ideas, we would suggest painted wooden chairs as shown. If you would like lounge chairs, perhaps bring in the blue and the yellow ideas with low coffee tables as shown (Made.com have a good selection of affordable chairs). We would suggest dressing each table with a terracotta pot with herbs and a glass tea light as shown. OTHER: If there is space, the addition of an olive tree would be lovely and perhaps a ladder for magazines and newspapers as shown.